Diodorus Siculus (Greek: Διόδωρος Σικελιώτης Diodoros Sikeliotes) (fl. 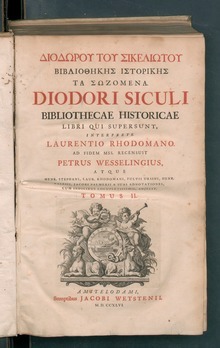 1st century BC) or Diodorus of Sicily wis a Greek historian. He is kent for writin the monumental universal history Bibliotheca historica, much o which survives, atween 60 an 30 BC. It is arranged in three pairts. The first covers mythic history up tae the destruction o Troy, arranged geografically, descrivin regions aroond the warld frae Egyp, Indie an Arabie tae Greece an Europe. The seicont covers the Trojan War tae the daith o Alexander the Great. The third covers the period tae aboot 60 BC. Bibliotheca, meanin 'librar', acknawledges that he wis drawin on the wirk o mony ither authors. This page wis last eeditit on 18 November 2017, at 14:30.